Learn About the U.S. > The US Through the Year > Local Festivals > Cherry Blossom Festival, Washington D.C.
Cherry Blossoms have become a featured attraction in Washington D.C.
Photo Courtesy of Theodor Horydczak Collection. Photo by Theodor Horydczak. In 1912, Mayor Yukio Ozaki of Tokyo presented over 3,000 cherry trees to the United States as a symbol of friendship between the United States and Japan. The trees have remained a symbol of friendship between the two countries, and the government of Japan has since presented over 3,000 additional cherry trees as gifts to the United States. 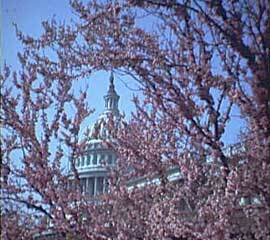 Today the cherry trees in Washington D.C. symbolize not only friendship, but also spring. Washington D.C. holds the National Cherry Blossom Festival yearly in March and April. Over a two-week period, more than 700,000 people enjoy the beauty of the cherry blossoms and the festival’s activities. One of the exciting events that takes place during the Cherry Blossom Festival is a giant parade that extends down Constitution Avenue. The parade features marching bands, dancers, floats, and famous guests. The Sakura Matsuri Japanese street festival also takes place during the Cherry Blossom Festival. It includes a sumo wrestling demonstration, a sushi demonstration by some of Japan’s finest chefs, and a Japanese drum group. The drum group that performed in the 2004 festival consisted of fifteen members who used twenty drums to create traditional Japanese music for the audience.